The new model offers an additional 15 millimetres of headroom. Meanwhile, the car's interior width at elbow height also increases by 61 millimetres. The boot has a volume of 278 litres, up 67 litres or around 30 per cent compared to the 3-door Hatch. 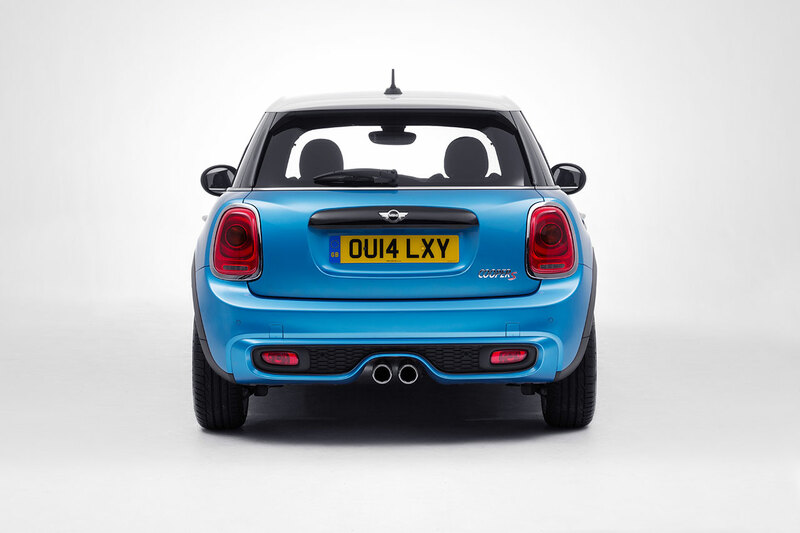 Like all MINI models, the new MINI 5-door Hatch has an unmistakable appearance. The body, greenhouse and roof are visually separated from one another. The window line tapers off to the rear, contributing to a dynamic wedge shape when viewed in profile. The wide track and short overhangs emphasise the striking design language of the vehicle's body. Traditional design features include the hexagonal contour of the radiator grille, the side indicator surrounds known as ‘side scuttles’, the circular headlights, the upright rear light clusters and the black periphery at the bottom edge of the body. 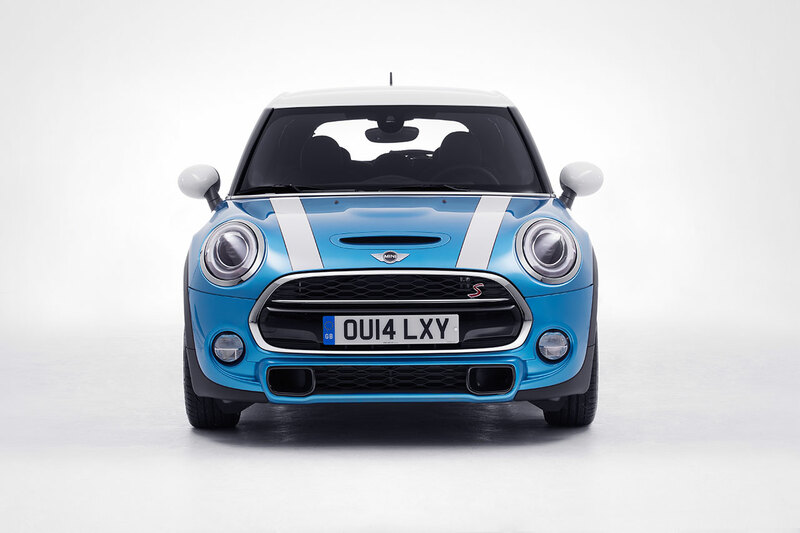 The MINI Cooper S 5-door Hatch and MINI Cooper SD 5-door Hatch models emphasis their sporty flair with a honeycomb pattern in the radiator grille, an anthracite bumper trim, bonnet scoop, brake air ducts integrated in the lower air inlets and a separate rear apron with exhaust pipes located at the centre. These model variants also bear a red ‘S’ logo with a chrome border, not only on the side scuttle elements but also on the chrome bar of the radiator grille. 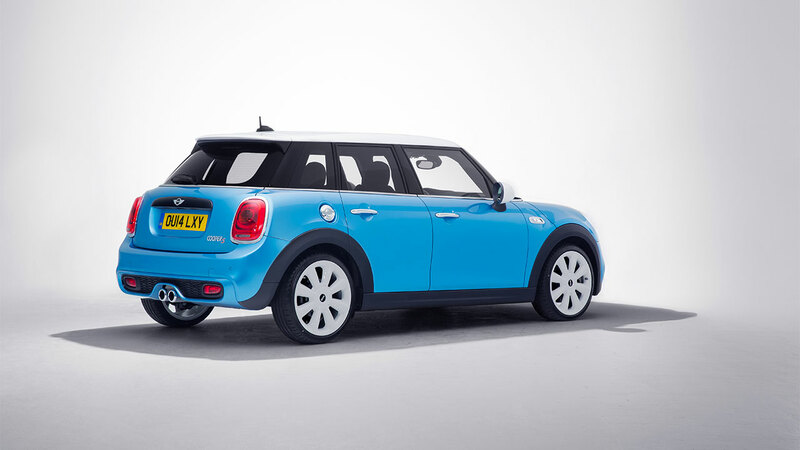 There is a palette of two solid and nine metallic exterior colours for the new MINI 5-door Hatch, including the return of customer favourite ‘Electric Blue’. In all models, the roof and exterior mirror caps can be finished in a contrasting colour, white or black, as a no-cost option. The new MINI 5-door Hatch comes with a six-speed manual transmission as standard featuring rev matching on downward shifts. A six-speed automatic transmission is available as an option on each engine. 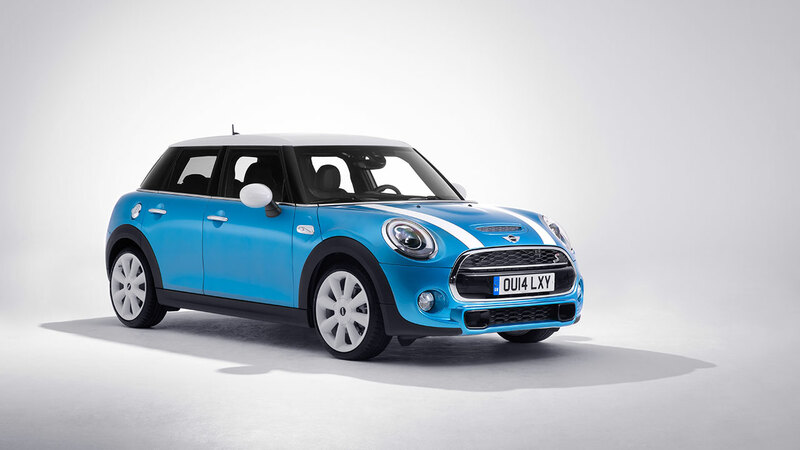 Both transmission systems were newly developed for the new generation MINI 3-door Hatch. The automatic features an engine start/stop function, preventing unnecessary fuel consumption. When used in conjunction with the MINI Navigation System, it’s able to take account of the selected route profile and control gear shifts. Based on navigation data, the appropriate drive position is selected to match the road ahead, preventing unnecessary upshifts. On the Cooper S and Cooper SD, a six-speed sports automatic transmission is available which enables even shorter shift times on the MINI Cooper S 5-door Hatch and Cooper SD 5-door Hatch, featuring rev matching on downward shifts and can be operated in manual mode using shift paddles behind the steering wheel. MINIMALISM environmental technologies continue to feature on all MINI vehicles, and the new Hatch is no exception. Designed to reduce fuel consumption, the suite of standard features includes a shift-point display function and optimised preheating process on the diesels. Brake energy recuperation and need-oriented control of the fuel pump, coolant pump and other ancillary units feature on all models. Depending on the model variant, optimisation of aerodynamic properties has been achieved by measures such as active cooling air flaps, extensive underbody trim and air ducting elements in the upper section of the C columns. With a drag coefficient (Cd value) of 0.30 (MINI Cooper 5-door Hatch, MINI Cooper D 5-door Hatch) or 0.32 (MINI Cooper S 5-door Hatch) and 0.33 (MINI Cooper SD 5-door Hatch), the new MINI 5-door Hatch is at the forefront its segment in terms of aerodynamics. The MINI 5-door Hatch features a high level of standard specification, including USB interface and Bluetooth, electrically adjustable exterior mirrors, front fog lamps and onboard computer. Air-conditioning is available free of charge on all models. These can be supplemented with a range of desirable options for comfort, convenience, additional functionality and customisation. They include two-zone automatic air-conditioning, heated front seats, panoramic glass roof, windscreen heating, rain sensors and automatic light control, a Harman Kardon hi-fi speaker system and a sports leather steering wheel. Other options include Park Distance Control, electrically heated and folding exterior mirrors, and both interior and exterior mirrors with automatic anti-dazzle function. 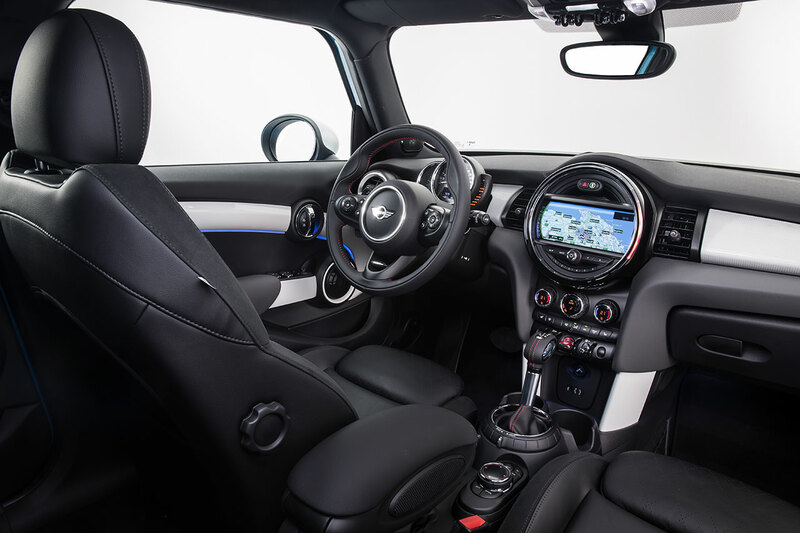 The MINI 5-door Hatch’s standard display and operating controls can be supplemented with a class leading 8.8 inch display, fitted in the central instrument, as well as the MINI Touch Controller. An optional LED light ring for the central display provides visual feedback to the driver. For example, when Park Distance Control is activated, the remaining distance to obstacles is shown by means of a ring of light which is illuminated in green, yellow or red – supplementing the graphic display. 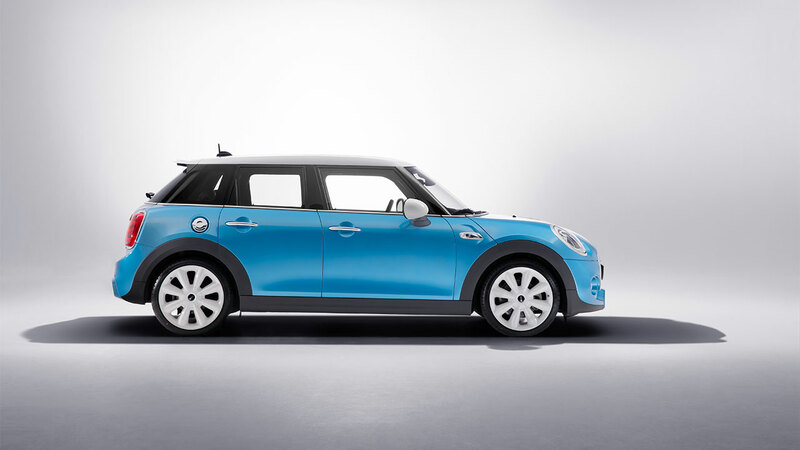 Like its 3-door sibling, the MINI 5-door Hatch is the first car in its class to offer the option of LED headlights. The bright white units provide the light source for both low and high beam. They are also surrounded by an LED daylight driving ring, the lower section of which reaches down to the white turn indicators. Other key equipment options available include LED fog lamp, ambient interior lighting and Comfort Access. MINI Connected or MINI Connected XL is also available in conjunction with the MINI Visual Boost Radio and the MINI Navigation System on the MINI 5-door Hatch. It offers extensive integration of smartphones inside the car, enabling the use of internet-based services in the areas of infotainment, communication and driver experience. This functionality is provided via a diverse and continually expanding number of apps which are downloaded to a connected smartphone. MINI Connected XL now includes the Journey Mate function for networked navigation, with Real Time Traffic Information. The MINI Connected app and MINI Connected-ready apps supplied by third-party providers are available for the Apple iPhone and a number of smartphones using the Andriod operating system. MINI Connected remains the access point for vehicle-related functions such as Mission Control, Dynamic Music, Driving Excitement and the MINIMALISM Analyser. MINI Connected is also the way into online-based services such as web radio, the use of social networks including Facebook, Twitter, foursquare and Glympse, receiving RSS news feeds and entertainment features such as AUPEO!, Stitcher, Deezer, Audible, Napster and TuneIn. Another innovative feature is the Intelligent Emergency Calling (E-call). This MINI option is a first in the premium compact car segment, and is used to establish phone connections required for the use of optional functions such as Emergency Call. In the event of an accident, this system automatically detects vehicle location, accident severity and contacts a call centre to initiate fast and effective assistance. The SIM card also enables use of MINI Teleservices. This class-leading telematics feature provides automatic transmission of service-related vehicle data to a MINI Service Partner of the customer's choice. Precise lines, premium colour and material combinations and modern functionality highlight how the MINI 5-door Hatch’s cabin is a contemporary reworking of a design classic. The horizontal structure of the cockpit and the circular or elliptical contours of central features such as air vents, instruments and door trim are among the best-loved MINI design elements. The innovative display and controller is ideal for safe and intuitive use of the various driver assistance systems, infotainment and comfort functions. The instrument cluster on the steering column displays road speed, engine speed and fuel level. The speedometer scale includes a colour panel for Check Control messages, vehicle status displays and visual indicators relating to driver assistance systems currently activated. As soon as the key is inside the car, the engine of the new MINI 5-door Hatch can be started by pressing the toggle start/stop button located in the middle of the centre console, which glows red. The extended interior space along with numerous clever details makes the new MINI 5-door Hatch extremely functional and practical. The rear backrest with a 60:40 split can be folded down. This enables the load volume to be increased in stages as required, from 278 litres to as much as 941 litres. Numerous cupholders and cubby holes make it easy to take drinks and travel items in the car, and there is an additional storage compartment is optionally available behind the trim strip on the passenger side. A storage package is also available as an option, and includes a double dual-section load compartment floor, additional lashing eyes and floor net for the luggage compartment, seats which can be angled more steeply so as to create more luggage space and map pouches for the backrests of the front seats. Seats in a fabric/leather combination and leather finish are offered as an alternative to the standard fabric version. The MINI Cooper S 5-door Hatch and the MINI Cooper SD 5-door Hatch are fitted with sport seats as standard and these are also available as an option for the other variants. The sport seats offer excellent lateral support and adjustable thigh support. 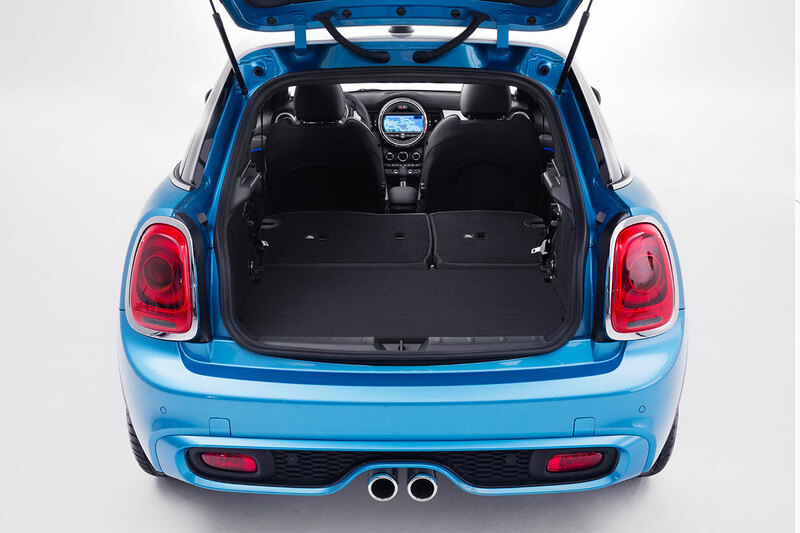 Intelligent lightweight construction means that weight reduction in the MINI is combined with a high level of rigidity. The result is improved agility and occupant protection. In spite of the wide range of fittings, virtually all variants of the new MINI 5-door Hatch are lighter than their competitors in the segment. Highly resilient load-bearing structures, advanced deformation zones and an extremely stable passenger cell provide an excellent basis for keeping impact energy away from passengers and ensuring maximum occupant protection. The safety concept behind the new MINI 5-door Hatch is geared towards achieving maximum scores on all the relevant crash tests worldwide. 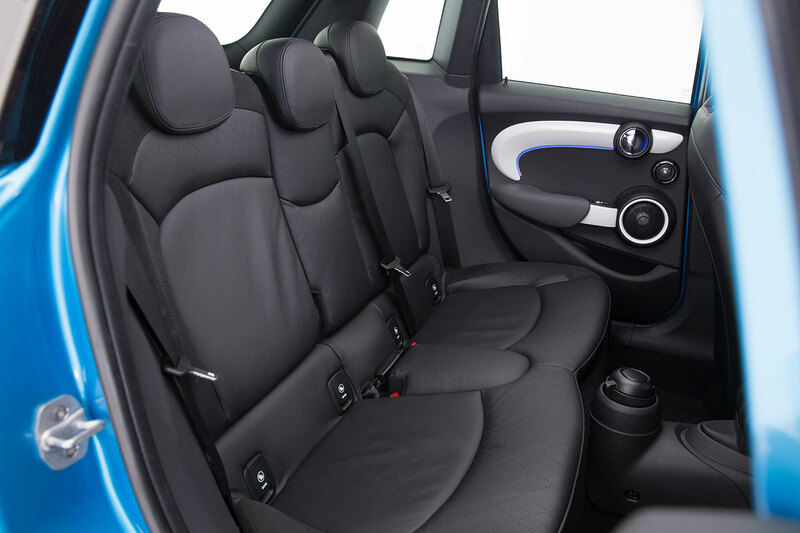 The standard safety fittings of the new MINI 5-door Hatch comprise front and side airbags, as well as curtain airbags for the front and rear seats. All seats are fitted with 3-point seat belts, belt tensioners and belt force limiters at the front. ISOFIX child seat mountings are provided at the rear and the front passenger seat. The MINI 5-door Hatch continues to innovate with a range of technologies designed to help protect those inside and outside the vehicle. They include the optional MINI Head-Up-Display which shows information relevant to the driver on an extendable monitor in the upper section of the dashboard. With the new Driving Assistant option, a camera-based cruise control and distance control function which automatically maintains a predetermined distance from the vehicle ahead. It includes a collision and pedestrian warning system with initial brake function, road sign detection and high-beam assistant. 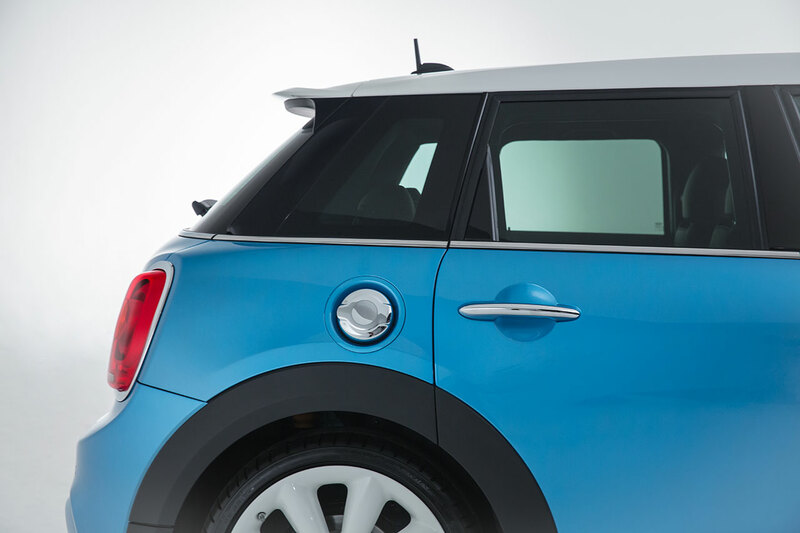 A rear view camera and parking assistant are also available for the MINI 5-door Hatch. In addition to ABS anti-lock brakes, electronic brake force distribution (EBD), cornering brake control (CBC) with brake assistant, and driving stability control system (DSC), the new MINI also includes a drive-off assistant, brake dry function, fading brake support and dynamic traction control (DTC). This latter system permits controlled slip at the drive wheels so as to facilitate driving off on loose sand or deep snow. The new MINI Cooper S 5-door Hatch and MINI Cooper SD 5-door Hatch feature a performance control system, which counteracts any tendency to understeer, supporting an agile yet neutral driving response in corners. Built at Plant Oxford, MINI’s state of the art global manufacturing base, the MINI 5-door Hatch will hit UK roads this autumn.